So the History tours are…well, history! Maiden will still be alternating between new album tours and retro tours, but the period recreations are over. These setlists revived a load of songs we hadn’t heard in ages, but they also left out crucial tracks for what was probably their last shot at being performed on stage. We’ve earlier stated our top 10 of the obscure Iron Maiden songs, so this time we’re focusing on tracks that we thought had a fair chance of being played live at certain points in time. Almost exclusively lamenting lost opportunities on the History tours, but also pointing out some other bewildering omissions, here are the 10 songs we have been the most disappointed at not finding in the setlist. Let us know yours in the comments! One of the heaviest songs the band ever recorded, one of the best of their post-2000 period, and one that is so well suited to the three-guitar line-up. Having seen and heard amazing versions of Paschendale and Journeyman on the 2003-04 tour, immortalized in the Death On The Road DVD, the mere thought of them launching into the massive riffs and harmonies of Montsegur still induces goosebumps. Dave Murray and Steve Harris rock the house on the 2003-2004 Dance Of Death tour, but without riffing Montsegur for the masses. 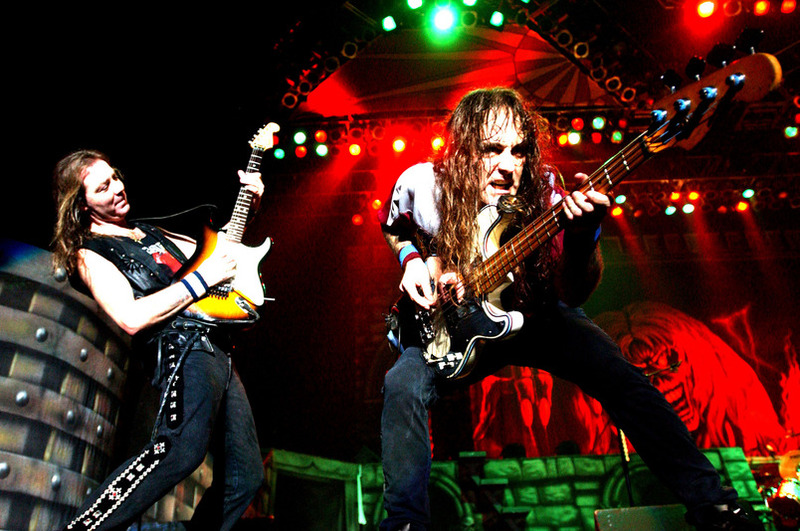 We discuss the Iron Maiden concert videos in this feature! Okay, the first one here is probably a stretch. But when the band decided to do a third History tour built on their 1980s catalog, this was one of the songs that were available to make the set fresh for band and fans alike. After all, it’s on the Maiden England video that gave the tour its name! The band opted to do a bare minimum of rare songs (The Prisoner and Seventh Son Of A Seventh Son, thank goodness) along with a host of regulars and semi-regulars that all featured on one or both of the previous two History tours. Our hearts break at the omission of this Piece Of Mind gem, and we’re pretty sure there will never be another chance. This tune never survived a single tour, believe it or not. When Iron Maiden took their 1986-87 Somewhere On Tour trek to the US they dropped it from the set, and it never returned. That in itself might have been heartbreaking for US fans that loved the Adrian Smith compositions on the new album. But just imagine how the reunion era line-up could have given this track an even heavier groove and an even better Bruce Dickinson performance. And here’s a collection of features on Maiden’s 1980s era! Okay, two fringe tracks so far, but how about the next one? This classic number was revived for a brief summer tour of Europe in 2003. But it would not be included in any of the proper History tours in 2005, 2008-09, or 2012-14. Why not, boys? How about replacing Fear Of The Dark with this one in 2008 and thus stay true to the period concept? Or could we not have gone without Another Life in 2005? Even when a sign in that tour’s stage dressing read “22 Acacia Avenue”, 22 Acacia Avenue wasn’t actually in the set. 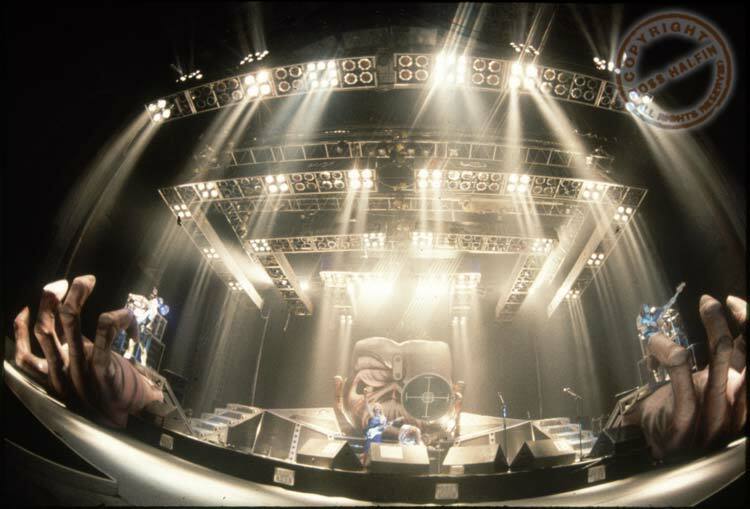 The title track off Maiden’s second album was brought back for the final leg of the Seventh Son tour in 1988, it is featured in the Maiden England video, but would not make its next appearance until the 1999 reunion tour. And that was it. Gone. Firstly, why did Blaze Bayley not get to sing more of the 1980-81 material that suited his voice a lot better than most of the Dickinson era songs? This track is one of those he never got to sing. And secondly, how about replacing Running Free with this one in 2012? It would have been logical and very welcome! The bloody Killers artwork was even featured in the stage dressing and merchandise, a proud Maiden tradition for songs that are not actually in the set. It would also have been a walk in the park for Bruce if he needed a rest in-between the more stratospheric numbers. There are a few Somewhere In Time songs on this list! That’s probably not too surprising since it’s the most underplayed material in Maiden’s catalog relative to its popularity, a fact which guest writer Adam Hansen laments in this article. 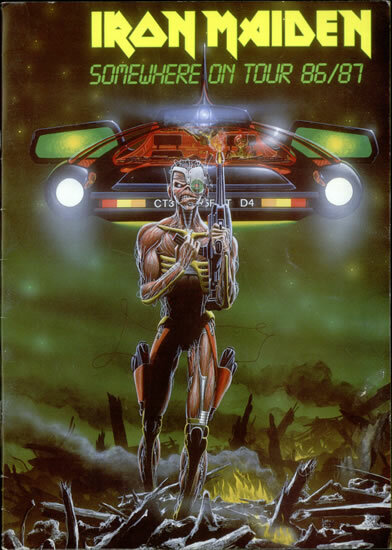 This 1986 track was a popular single, but didn’t survive past the Somewhere In Time tour, not even to make it into the 1988 set where the Seventh Son Of A Seventh Son visual aesthetic would have fitted it like hand in glove. It made a glorious return along with Dickinson and Smith in 1999, but only for about five shows. Gone. The chief musical events of the second and third History tours were probably the performances of period epics Rime Of The Ancient Mariner (2008-09) and Seventh Son Of A Seventh Son (2012-14). The 2005 History tour had the chance to deliver something equal to that: The first performance of the monumental Piece Of Mind climax To Tame A Land in more than twenty years. Alas, it was not to be. Dickinson was at the supreme height of his powers in 2005 and could certainly have delivered the goods. And there would not have been an outrage from fans if the band dropped something like Drifter and Sanctuary in order to fit this powerhouse into the set, would there? The album epic Alexander The Great was not a part of the 1986-87 world tour, and would never get another chance. A hit single, not played since 1986. Did you get that? Are you sure? Iron Maiden actually had a hit single, in America no less, and then didn’t perform the bloody thing for three decades! Some fans cite Harris’ reluctance to play it, but this is mostly based on a mid-90s Dickinson remark that “Steve never liked it.” Harris himself begs to differ, insisting that he loves all of Piece Of Mind but prefers the live version of Icarus to the studio version. And, well, if he played it live he’d be playing a live version, wouldn’t he? As you can tell, besides Somewhere In Time, we at Maiden Revelations also feel that the Piece Of Mind album is underplayed. Since the entire band agree that this album is among their greatest (unlike their divided opinions of Somewhere In Time), this is somewhat mysterious. Click here for our devoted Piece Of Mind gushing! This is it. The one we really have a hard time letting go of. Flight Of Icarus would have been a completely natural part of either of the first two History sets. But Infinite Dreams was a cornerstone of the 1988 Seventh Son tour, a highlight of (and the bloody single from) the Maiden England concert video. And Maiden just spent two years on the road with a show titled Maiden England, they issued the 1988 concert on DVD, they sold the tour as a focus on the late 80s Seventh Son era, and they … left Infinite Dreams out of the set. At least Icarus was up against its own period, but Infinite Dreams was dropped in favor of out-of-period track Afraid To Shoot Strangers. Painful. Heartbreaking. Could the band not hack it? Could Dickinson not sing it properly? Did Harris simply think that the fans wouldn’t shout and jump in unison because the song is too sophisticated? Will we ever know? So, what heartbreaking omissions did we leave out? Let us know in comments, and feel free to air what you otherwise think is wrong or maybe oh-so-right about our list. There’s more Trooper in the fridge. ← Vinyl re-release … Again! Sadly I think Bruce can’t perform Infinite Dreams properly anymore… that is my opinion,they even dropoed Hallowed Be Thy Name (another crazy song in vocal performance), probably because it is very demanding for Dickinson and he is taking care of his vocal shape and not taking too many risks (for good or for bad I don’t want to see Bruce making a paordy of himself and delivering poor performances like Paul Stanley does nowadays). If they had done a “1990s retro tour” and left out Tailgunner or Afraid To Shoot Strangers, I’d have a thing or two to say about it, but that concept never happened and can’t figure into this list. I considered listing Paschendale for the 2010 tour, but decided that I hadn’t really expected it to turn up at all, and still it did get a few airings. No heartbreak. I heard somewhere, I think it was in interview with Steve himself that he never liked the song itself. I don’t get it because HE WROTE BASICALLY THE WHOLE THING BY HIMSELF!!! WHAT. That’s not true. Steve has always stated that he loves all of Seventh Son, he always mentions it as one of his 2 or 3 favorite Maiden albums. Infinite Dreams was meant to be in the set, but was dropped during rehearsals for unconfirmed reasons. I think the list is a quite comprehensive one and adds many questions regarding the motives behind every single omission. I wanted to cry myself out more on this subject, but i guess it’s pointless. Let’s hope it’s not too late for the band to make at least one or two changes in their future sets. IMHO, The Trooper, Wrathchild and 2 Minutes to Midnight should not be part of whatever plans the band has. I absolutely agree, Andy! It would be great if one or two, something like Icarus, found their way into the next album tour. Would be a refreshing change. They’ve dropped tunes like Trooper, Wrathchild and even Beast before, so we know they are capable of it. A heartbreaking omissions is, from the last studio album, Mother of Mercy. I’d have loved to have have heard ‘The Alchemist’ played on The Final Frontier tour too. Sorry, bit off topic, but I wanted to get it in there! I’d have liked to hear both of those mentioned from The Final Frontier, but I didn’t think either of them was an obvious feature in that setlist. Nothing like Alexander The Great on the Somewhere In Time tour, and that sort of thing. Been thinking, and I have a couple glaring omissions to add to the list: Rainmaker in 2010 (Wildest Dreams? Blech. ), and Children of the Damned in 2005/2008. Apart from one gig in Florida, the US hasn’t seen that tune since 1987! Children Of The Damned was in the running right up until the end. For me personally it’s a Maiden tragedy, since I’ve never seen them play it. But it did show up for a couple of gigs in 2002, one leg of a tour in 2007 and one in 2009, so it’s not as MIA as the songs on this list. I’d gladly replace Still Life with this one though. This is true! Also, this is more of a category, but the fact that there have been no Blaze songs in the set since 2004 is pretty alarming too! They would be below the fringe tracks in spots 9 and 10, as well as below the honorable mention of Montsegur. At least until Maiden retire, and the list can be revised. I can’t agree more about Montsegur. It’s a genuine Maiden masterpiece in the spirit of DWYBO. It has great contrast between lyrics and music, epic battle song feeling and awesome guitar harmonies and lots of catchy riffs. It’s fun to play with guitar, too. Great site by the way, I’ve been following you since the beginning. Hey all , I’ve been reading the articles hear for a couple of months and they are some of the best written and thoughtful out there on Maiden. I decided to finally comment. When I first saw the premise of the article I immediately thought of “Caught Somewhere in Time” and “Children of the Damned”. I think they lost the ideal chance to do” Somewhere” on the Somewhere Back in Time Tour. I’m very biased towards SIT though and I wouldn’t complain if they added songs from it every tour! Great site here! Please keep up the great discussions! Good point about the tour called Somewhere Back In Time and the song called Caught Somewhere In Time. No-brainer, eh? Although at the time that tour was supposed to round off the whole of the 1980s, so omissions are a little more understandable. Fear Of The Dark kept one more 80s classic out of that set, which was a shame. really nicely done list. hard to really complain about any of your choices. my take on this? the band, especially at the top, “cough” Harris and Smallwood “cough” got lazy, complacent, and within boundaries. they didn’t want “to risk” anything… you could make an amazing setlist out of songs they haven’t played in decades… dunno if you have an overplayed songs list, haven’t surfed your whole (amazing) site, but as a 20+ years fan of the band I got to become really really tired of seeing songs like: Trooper, Number, Run to the Hills, Hallowed, Fear of the Dark, Running Free, Sanctuary, Iron Maiden (yes, I said it), and even not so overplayed once like Heaven Can Wait (I mean really? out of the epicness of the album that SoT is, you choose this one? )… other overlooked songs: Strange World, Die With Your Boots On, Be Quick or be Dead. btw, do you want “to not risk it”? make a damn club tour, and record it. Yes, Loneliness was played on the first show of the tour. I can understand that it’s a tough one to make work live though, it’s a really weird song really. Wrathchild is obviously a song they can easily pull out, so it’s often been the replacement song in cases like this. What would fit is Maiden playing as the only act. This would allow the band to play a longer set. There are just too many classics not being performed. They could possibly add more days off between gigs for much needed rest. I don’t know if this would work do to the energy that must be released to go out there on stage and perform at their best. 1 h 45 min would most likely never change. Nicko and Bruce have to pace themselves to be able to do this at their level and age. I’ve never heard or seen Back In The Village mentioned anywhere, so unless it’s a complete typo or some such mistake I guess Adrian might have recalled them trying it out in rehearsal and ditching it. I know that. it’s like the wiki of the setlists. still, who would want to troll about an IM tour from 1985? Prodigal Son seems to have gone the way that Infinite Dreams went in 2012, but at least Prodigal Son had never actually been performed live before. Flight of Icarus *shakes head* Just truly baffling. I mean, is it cause Bruce can’t sing the high note at the end anymore? Cause that wouldn’t ruin it for me if he couldn’t. Besides, that’s no excuse for it not lasting past 1986! Maiden should make, allmost never played tracks tour, cause Iron Maiden song must be in the setlist! An the we should start with songs like Alexander, Montsegur, Nomad, …..
Or maiden should do the Epic songs tour with songs like, Prodigal son, Alexsander, Mother Russia, To tame a Land…..plus ad songs like Still life, Icaruss, Montsegur…. At least, they should put on ther web site, the fans most voted songs and then pick 3 – 5 tracks form that list, they never played or really rear played, and include them on the next tour….Something like that. And yes, the list is great, I pray for Infinite dreams, The Prophecy, Stranger, Killers and of course ALEXANDER! Fantastic songs. Only The Good Die Young tops our list of deep Maiden cuts. But these can’t be among the saddest omissions, since it was not to be expected that they would play all eight tunes on the Seventh Son tour. They never did that kind of thing. Great list, you hit the nail right on the head. Only one I’d question is To Tame A Land, simply as I’m not much of a fan of it, but it absolutely would have fitted in with the Early Days tour. It’s the absence of the singles I find most surprising – Flight Of Icarus, Infinite Dreams, Stranger In A Strange Land; I would have thought those would be the first tracks they’d put on the list. Infinite Dreams I had assumed would be the main highlight of the Maiden England tour, as The Clairvoyant had popped up previously in 2008. I guess the presence of Afraid To Shoot Strangers confirms that there won’t be a 90s-era tour, which I think is a shame, as I really like most of their stuff from around then. Judas Be My Guide and Como Estais Amigos would be incredible live. They could even get Blaze’s band as the opening act. Purgatory seems a strange exception from the 2005 tour, that’s always the track from Killers that’s stood out for me. Totally agree with you that the Maiden England tour needed them to go deeper, not just revisit those already resurrected for Early Days and Somewhere Back In Time. Just glad I didn’t decide to buy a Sonisphere 2014 ticket just for Infinite Dreams – saw them at the O2 in 2013 but they mentioned retiring songs at Sonisphere, I wondered if Infinite Dreams might make a special appearance. Evidently not. Regarding Infinite Dreams, it was meant to be in the Maiden England set, as evidenced by the official pic of the lighting desk having both Infinite Dreams and Hallowed Be Thy Name programmed. It was apparently dropped in rehearsals and replaced with Afraid To Shoot Strangers. Some people speculate Bruce couldn’t sing it properly, but there’s no confirmation of why it was dropped. Purgatory rules, and made THIS LIST. Solid list. Infinite Dreams is my favourite Maiden song! I’ve seen Maiden in concert three times but I don’t think I’d throw down the cash to see them again. However if Infinite Dreams was on there I’d be sold!! Grab your Powerslave vinyl and play the first song on side two. What do you get? ‘Back In The Village’ is one of the best ever Maiden tracks ever written and yet they’ve never, ever performed it live. This is the only real complaint I will have about IM, one of my favourite bands and it is lamentable. Guys…Flash of the Blade, with the three amigos to play the bridge in full? Get in! It wasn’t even featured on the original Powerslave tour, so it definitely wouldn’t be expected in the post-2000 era. No heartbreak there.